It’s 2 a.m. and you’ve just heard one of the most awful sounds (and smells) in the world: your doggo getting sick at the foot of your bed. Just like humans, some pups have stomachs that are super sensitive, and even the smallest thing can cause them to have diarrhea or vomiting episodes. If you’ve got such a pup, you probably know that finding the right food is pretty tricky — and that deviating from their normal routine even slightly can spell disaster. Below we’ve outlined some of the top recommended foods for dogs with sensitive stomachs. Before we dive into food recommendations, let’s first quickly cover some of the common signs that your dog has a delicate tummy. Frequent vomiting — dogs are known to vomit periodically, but if your dog has a difficult time keeping anything down then a sensitive stomach is probably part of the issue. Excessive gas — this is not pleasant for anyone, but especially not your pooch. Gurgling stomach — if your pup’s stomach is making some wacky noises, there’s probably some upset going on. Diarrhea — if your dog isn’t passing firm stools then food is moving too quickly through their system. This is messy, but it also leads to more serious issues such as lack of absorbed nutrients and dehydration. Breaking training — Defecating inside the house, especially if they’re otherwise well house-broken. This is a sign they’re not able to hold it until they go outside and/or that they’re seeking immediate relief. Lethargy and malaise — nobody wants to be active when they’re not feeling well! 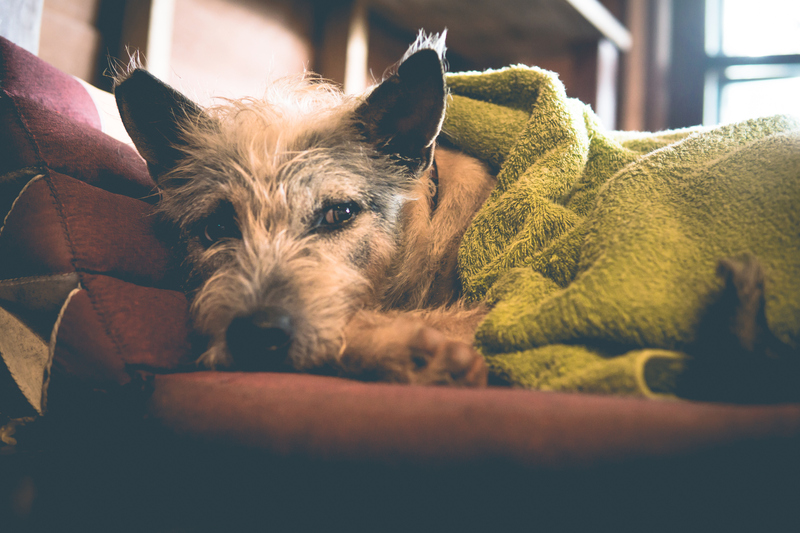 If your dog suffers from an acute sensitive stomach (meaning it’s not chronic), you can take some steps at home to help get through the bout of vomiting and diarrhea. Remember – if this lasts longer than 24 hours, please call your vet as it may be something serious like pancreatitis or a foreign body ingestion. Keep Your Dog Hydrated: Make sure your pet is fully hydrated by giving him fresh, clean water. Dogs with diarrhea and vomiting can become dehydrated very quickly. Withhold Food: Most veterinarians will recommend withholding food from a dog who has stomach issues for 24 to 48 hours, so that the culprit can work its way out. A Bland Diet: If withholding isn’t working, vets also advise giving dogs plain, boiled chicken and rice. 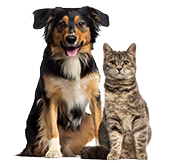 Arlington Animal Hospital says, “Since bland diets are low in fiber, stool production slows and defecation is less frequent. Bland diets are fed to rest the gastric system and to help promote normal stool formation.” Pumpkin is another vet-approved food that can help ease stomach conditions and has been known to help with parasites. Elimination Diet: Pets being tested for a food allergy or intolerance may need to go on a bland elimination diet to determine the cause of their symptoms. Ask your vet for the exact route your pup needs to take and expect to try all sorts of new proteins in the future (kangaroo, alligator, and more!). Medication: You may need to bring in a stool sample so your vet can test for parasites or other causes for stomach upset. If the stool tests positive for parasites, you will need antibiotics or anti-parasitic medication, and this usually is administered every day for 7 to 10 days. If the stool is negative for parasites, your vet may do a physical exam and will run a blood test to check for elevated enzyme levels in the liver to determine the cause of tummy upset, which can be a foreign body issue, pancreatitis, or chronic condition. Give medicines like Pepto Bismol only under a vet’s supervision or with their recommendation. The following brands can promote better digestion in dogs with sensitive stomachs. Nature’s Recipe has an entire line of food for dogs with sensitive stomach aptly called “Easy to Digest.” Options include a chicken meal, rice, and barley dry food; grain-free chicken and venison wet food; chicken, rice, and barely stew; and others. Each contains whole grain fibers to help support digestion. NUTRO Natural Choice makes a Limited Ingredient line of wet and dry foods to better help you find the perfect food for pups with sensitive stomachs. Such limited ingredient foods may be preferable over those that combine multiple proteins. Options include Venison Meal & Sweet Potato, Lamb & Sweet Potato, Salmon & Lentils, Duck & Lentils, Fish & Potatoes, Turkey & Potatoes, and Lab & Potatoes. Royal Canin Maxi Sensitive Digestion was formulated specially for large dogs, over age 15 months, with sensitive stomachs. Ingredients help improve and maintain digestive health for a stronger stomach and firm stools, as well as improve skin, coat, bone, and joint health. The primary protein is chicken, and it also contains rice, flour, what, and dehydrated beet pulp. The inclusion of probiotic supplements can also help promote better digestive health for your dog. To find the best option for your pet’s needs, we recommend asking your veterinarian for recommendations. One of our favorites is from NomNomNow, which you can read more about pets and probiotics here, or check out their Probiotics for Dogs supplement. Not sure if you should see the vet? If you’re in-between annual appointments and trying to decide if you ought to make the haul, a good rule of thumb is to consider what’s “normal” for your dog. If your dog suddenly can’t keep anything down, has diarrhea, is lethargic, depressed, or is not engaging in their favorite activities, a vet visit should be priority #1. If you’re enrolled in pet health insurance, you know that visiting the vet isn’t a financial struggle, as your policy can cover up to 90% of those vet bills. Your vet will ask you questions and run some tests to determine what could be causing the issue. From there, you can get a diagnosis and a treatment plan. The issue could be something as minor as a stomach bug, or it could be something more serious like a parasite infection, which needs antibiotics, or pancreatitis, which may need hospitalization. Either way, it’s important for you to address the issue swiftly so your dog can feel better. Stomach issues are the second most common reason why our pet parents visit the vet. From chronic GI issues to a sudden bout of toxicity, by enrolling in pet insurance you can save up to 90% on vet bills, so you can say “yes” to seeing the vet and getting critical treatment. You can start by getting a free quote.